The law firm of Badham & Buck, LLC, is composed of experienced, versatile trial attorneys who specialize in complex civil litigation representing both plaintiffs and defendants. We have cases pending in courtrooms in Birmingham, Alabama, and throughout the southeastern United States. Our primary areas of practice are commercial disputes, business torts and catastrophic personal injury claims. Our experience with commercial cases includes: contract disputes, business and consumer fraud, interference with business relations, derivative litigation, shareholder disputes, lender liability and trade secret violations. We have handled cases in a wide array of industries such as health care, transportation/trucking, software development, agriculture, insurance, banking, accounting, venture capital and many others. We represent clients in state court, federal court and arbitration and work on individual claims and class actions. On the personal injury side, we handle cases involving auto accidents, trucking accidents, defective or unreasonably dangerous products (product liability), property owner negligence (premises liability) and pharmaceutical drugs. Our clients are as diverse as this law practice. In short, we are available to help any person or business that needs sophisticated legal representation. We have won multimillion dollar verdicts for individuals and businesses, and we have successfully defended companies ranging in size from small, closely held businesses to Fortune 500 corporations. Brannon Buck and Percy Badham are AV-rated* attorneys by Martindale-Hubbell and have been selected by their peers as Alabama Super Lawyers. Percy Badham and Brannon Buck have also been selected by their peers as two of the Top Ten Alabama Super Lawyers and Sam David Knight has been selected by his peers as one of the "Top 50" Alabama Super Lawyers. Each of our attorneys takes pride in being a leader in the legal profession, as evidenced by the offices and positions each has held in the Birmingham, Alabama, and American bar associations. Our attorneys are also actively involved in their community — donating substantial time and resources to numerous state and local non-profit organizations. We are trial attorneys who specialize in complex civil litigation representing both plaintiffs and defendants. 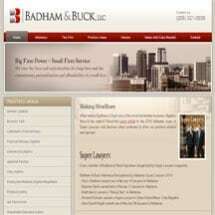 Walker "Percy" Badham III and Brannon J. Buck founded Badham & Buck, LLC, in January 2008. Percy, Brannon and Brett Ialacci have over 38 years of experience among them. The lawyers of Badham & Buck have a vast array of experience prosecuting tort claims on behalf of businesses arising from commercial relationships in both state and federal courts throughout the Southeast. The lawyers of Badham & Buck have extensive experience defending a wide variety of businesses in commercial litigation in federal and state courts. These cases involve claims by consumers, customers or other businesses in contractual relationships. Badham & Buck represents individuals who have suffered catastrophic injuries caused by automobile collisions and defective products. We have recovered millions of dollars on behalf of our personal injury clients.